Any ideas ?. Worth running some fine wet n dry over the marks ?.. or no point ?. Everything looks well lubricated. Note: I use 10W50 4T Cross Power Motorex fully synth. I service bike every 6 months or 3500km (or whatever comes first). I warm the bike up to 5 bars idle every time I go to ride it. I'm the 1st owner. Bike has only done 37000km. Last edited by limeyduffa on Thu Jun 14, 2018 10:44 pm, edited 1 time in total. Aphex wrote: Picture isn't working. Those look terrible, I wouldn't be re using them and I'd be trying to find out what's caused it. How's the cam surface? Motogoon wrote: Those look terrible, I wouldn't be re using them and I'd be trying to find out what's caused it. How's the cam surface? Yep, what I thought too. The intake Cams (the cams that contact these worn buckets) look good (to my untrained eye). I'll do what you said, and find out what caused this damage. Are the valve buckets plated on the LC8? To my untrained eye I'd say it looks like pitting from a coating is coming off. I'd pull those buckets and try to look at the them under a strong magnifying glass, just to see if those marks were caused by the surface flaking away or by a foreign body being pressed in. An enlarged pic of my damaged bucket. Yes, Rich, looks like the coating is flaking off. 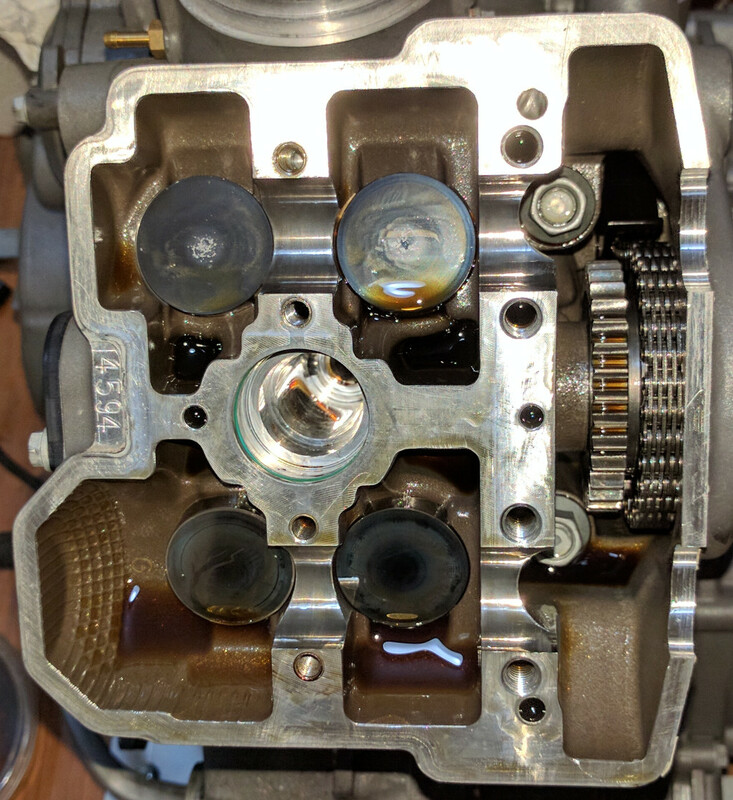 Another SMT owner has reported the same fault at 40,000 miles. Haha good to hear, yeah there's definitely a technique, second one went in piece of piss once I'd worked it out as well, I think the worst part is just the access. limeyduffa wrote: An enlarged pic of my damaged bucket. Yes, Rich, looks like the coating is flaking off. Another SMT owner has reported the same fault at 40,000 miles. That's kind of good really I guess that it's just a dodgy finish rather than an oil starvation problem! Couple of New buckets and a re-shim then should be good to go? Motogoon wrote: That's kind of good really I guess that it's just a dodgy finish rather than an oil starvation problem! Yep, agree. Now the hard bit: Getting them !. Not sure if you know, but a series of GST laws are kicking in here next week. I have no idea what this going to do to the logistics supply system. KTM Australia (via the Australian KTM dealers) couldn't organise a fist f*k in a brothel with a fist-full of fifties, and gave up with them years ago. I have been using Fowlers in England, who are ready good, but they are so backlogged at the moment (they are probably getting smashed with AU panick orders). I'm also producing a video of my repair since there doesn't appear to be any tube/vimeo videos of pulling down an LC8. This will take some time, because it's a lot of snipping video and merging with photos from phone. I'm about 20% complete. Watch this space. What a great post, I really appreciate you taking the time to document everything so thoroughly. My front base gasket is leaking a bit at 40,000 miles so it'll be time to tear into it soon and might as well hone the cylinders if they need it while I'm in there. Looking forward to your video.